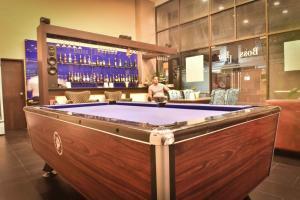 Located in the heart of Bangkok on Sukhumvit 4, Boss Suites offers themed modern rooms and an indoor pool. It provides free Wi-Fi and free tuk-tuk services to Nana BTS Skytrain Station. 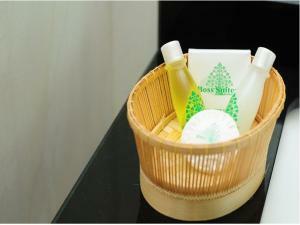 Rooms at Boss Suites are decorated in Thai, Chinese and Japanese styles. Featuring wooden flooring, each room has a flat-screen TV and a DVD player. The private bathrooms are equipped with massage showers and hairdryers. Staff at the 24-hour front desk can help with tour bookings, luggage storage, and laundry services. Buffet breakfast is served daily. The restaurant features international dishes and garden views. Drinks can be enjoyed at Coffee Bar, which also provides a selection of reading materials. Boss Suites is 22 km from Suvarnabhumi International Airport. 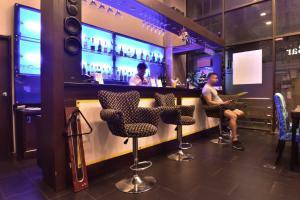 Situated along Sukhumvit Soi 4, it is surrounded by shopping and dining options. This room features a flat-screen TV and a DVD player. Spacious suite features a living room and bathroom with bathtub. It has a flat-screen TV and a DVD player. Rate: THB 1299.00 ... THB 3300.00; select dates below to get current rates.